New Rochelle, NY, March 7, 2018–Researchers have shown that a wide variety of synthetic antisense oligonucleotides with different chemical modifications can activate the frataxin gene, which contains a mutation that decreases its expression in the inherited neurologic disorder Friedreich's ataxia (FA). This new finding, which demonstrates a broad range of flexible options for identifying novel compounds capable of increasing frataxin protein expression and alleviating the effects of FA, is published in Nucleic Acid Therapeutics, a peer-reviewed journal from Mary Ann Liebert, Inc. publishers. 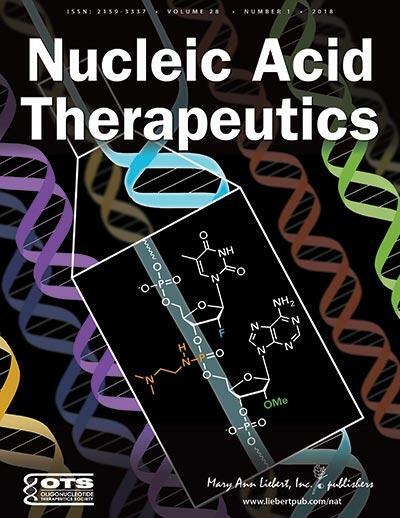 The article is available free on the Nucleic Acid Therapeutics website until April 7, 2018. The article entitled "Activation of Frataxin Protein Expression by Antisense Oligonucleotides Targeting the Mutant Expanded Repeat" is coauthored by David Corey UT Southwestern Medical Center at Dallas, TX and coauthors from Ionis Pharmaceuticals (Carlsbad, CA), McGill University (Montreal, Canada), and University of Massachusetts (Worcester, MA). The researchers show that various nucleic acid compounds with a range of chemical modifications are able to bind to the abnormal GAA repeat sequences in the FA gene. They demonstrated this in multiple cell lines derived from FA patients who had varied numbers of GAA repeats, implying a strong foundation for future drug development. "The resources and long-term commitment required to pursue these types of investigations underline the needs and benefits of academia-industry collaborations that are advancing the field," says Executive Editor Graham C. Parker, PhD, The Carman and Ann Adams Department of Pediatrics, Wayne State University School of Medicine, Children's Hospital of Michigan, Detroit, MI. Research reported in this publication was supported by the National Institutes of Health under Award Number GM R35118103. The content is solely the responsibility of the authors and does not necessarily represent the official views of the National Institutes of Health.